Click HERE to Hear a typical dead Catholic Rosary (vain repetition) being chanted. Those who want to fellowship with the Roman Catholic Church and accept it as the true “church” are ignoring its blasphemous teachings concerning Mary. The Catholic religion is straight out of the pits of Hell! The Vatican II Council and the New Catholic Catechism reaffirm the Catholic heresy that Mary is the sinless Mother of God, that she ascended bodily to Glory and was crowned as the Queen of Heaven, and that she can hear and answer prayers. Of course, no such teachings are found ANYWHERE in the Holy Bible. Mary is NOT the Queen Of Heaven, nor did she ascend bodily into Heaven, and Mary certainly is NOT sinless! The mother of Jesus was a dirty sinner, just like you and me (Romans 3:23)! I've actually had Roman Catholics get upset with me for teaching their loved ones that they were “sinners” while witnessing to them. Where in the world did anyone ever get the twisted idea that Mary was sinless? No such teaching is taught in the Word of God. The ONLY sinless person Who ever walked this earth was the precious Lord Jesus Christ. 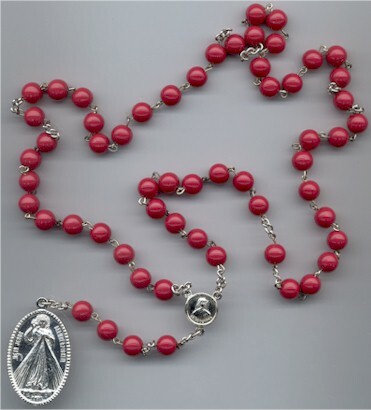 The Catholic Rosary is a chant, a prayer to Mary. Though Catholics like to point out that they are not praying to Mary, the 2nd of the ten commandments clearly prohibits and warns us NOT to BOW DOWN to any graven image. God in the 2nd Commandment even goes as far as to warn us against bowing down to the likeness of anything, in HEAVEN OR EARTH. Mary worship is a sin! Pope John Paul II was a great Mary lover. In his book Crossing the Threshold of Hope, the former Pope testifies that his personal devotion to Mary was developed at Marian sites such as Jasna Gora (home of the Black Madonna) in his homeland of Poland (Crossing the Threshold of Hope, p. 220). The Pope has “Totus Tuus” (All Yours) embroidered on his papal garments, designating his “abandonment to Mary” (Crossing the Threshold of Hope, p. 215). After the Pope was shot during an assassination attempt in May 1981, he attributed his subsequent recovery to Mary, and it was at shrines such as Jasna Gora and Fatima that he has expressed his thankfulness to the “Queen of Heaven.” He prays to Mary daily. This is an abomination unto the Lord. According to the Marian Library, about 80% of the Catholic shrines are dedicated to Mary. (Several years ago, Wilson Ewin, who researched Roman Catholicism for many decades, reported that he knew of only one Catholic church in the world that is named for Jesus Christ. All the others are named for Mary or other Catholic “saints.”) Each year, 10 million people visit the shrine of Our Lady of Guadalupe (Mexico), 6 million to Lourdes (France), 5 million to Czestochowa (Poland), and 4 million to Aparecida (Brazil). Those are just a few of the shrines dedicated to a false Mary which are visited by tens-of-millions of people, who are all searching for religious blessing and miraculous healing. Oh, foolish people! The above promises are a bunch of LIES, straight from the abyss of Hell. Mary was a dirty sinner, just like you and me. Mary has been dead since the 1st century A.D., she surely cannot make any promises. We are clearly taught in Hebrews 1:2 that God speaks to us today through His Son, Christ Jesus; NOT the Pope or Catholic religion! Jesus is the Living Word as revealed in the the Written Word. The Catholic religion is a conglomerate of several pagan religions dating back from ancient times. The whole heretical concept of a “Mother God” began with Nimrod and Semiramis at Babel in the Old Testament. If you'd like to know more about this, please read The Two Babylons. also read A Woman Rides the Beast. There is so much heresy and manmade tradition within the Catholic religion that one has to seriously ponder the incredible ignorance of of average Catholic. Or is it just ignorance? Perhaps it is wickedness and deliberate rebellion against the truth of God's Word. I believe most Catholics have heard the simple Gospel of Jesus Christ, but reject it because it goes contrary to most of their Catholic traditions. Instead, they have adopted a substitute for the Gospel which adds works to grace. The Gospel plus anything equals a false plan of salvation. I triple-dog dare you to study the Word of God for yourself and find if the teachings of the Catholic religions are Scriptural. For example: 1st Timothy 4:1-7 clears warns us about false prophets who would come, forbidding people to marry or to eat meat. The Catholic church is guilty of both. I dare you to show me the Rosary anywhere in the Bible. Matthew 23:9 clearly warns us NOT to call any man our “Father” upon the earth because God is our ONLY spiritual father. Only God is called reverend in the Scriptures. Psalms 89:7, “God is greatly to be feared in the assembly of the saints, and to be had in reverence of all them that are about him.” Yet, Catholics call their priests “Father” persistently in direct violation of the Bible. There is NOTHING in the Bible about “Sacraments,” let along the “Seven Sacraments” as taught by the Vatican. The Bible clearly teaches that there is only ONE Mediator between God and men, the man Christ Jesus (1st Timothy 2:5). So why are we told by the Catholic religion to confess our sins to a sinful priest or Pope, instead of only to our Lord Jesus Christ directly? Who died upon the cross for you? Jesus died for us, to pay for our sins, not the Catholic priest! No priest or Pope can absolve, forgive or perform “Last Rights” upon you to cleanse your sins away. ONLY through faith in the precious blood of Jesus Christ can we obtain the forgiveness of sins (John 14:6; 1st John 1:7). 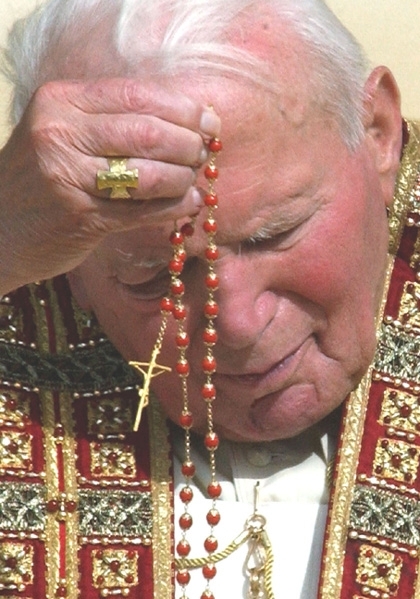 The Vatican's promise of reciting the Rosary is wicked. It leads people away from trusting upon Jesus Christ alone. Mary is dead, she died nearly two millenniums ago. Mary has not spoken to anyone upon the earth since her death. Mary is in Heaven today, but she is NOT elevated in anyway above any other virtuous women throughout history, who lived an obedient life for God. We must not make the foolish mistake (and sin) of elevating any sinner (such as Mary) above being a dirty rotten sinner, deserving of eternal fire in Hell. I worship Jesus Christ, God the Father and the Holy Spirit of God; One God (Scripturally called the “Godhead”). God has has manifest Himself to mankind in the form of three individual and distinct persons. To those who believe, no explanation is necessary; to those who believe not, no explanation is possible. Do you believe that the Bible is God's inspired Words? I certainly do! Mary cannot make any promises to you, me nor anyone else because she has been dead for nearly 2,000 years. Please don't be deceived by the evil inventions of foolish men and women rebellious against God Almighty. Mary worship is a sin! Even bowing to a statue of Mary is a sin! Counting beads while saying a “Rosary” is formalism, religious heresy, and a big waste of your time! The Rosary is of the Devil!!! Do you really believe that Mary can give you anything? Do you really think that Mary can soften up Jesus to be nice to you, as if the Lord isn't gentle and sweet to begin with? Do you really think that God is impressed with chanting a dead Rosary? If you do, I feel sorry for you because the Devil has blinded you (2nd Corinthians 4:3-4). My friend, religion if often used by Satan as a substitute for the Gospel of the Lord Jesus Christ. Kaballah is a substitute for the Gospel. Evolution is a substitute for the Biblical account of Creation. Billions of people throughout history have thought that good works could get them to Heaven, but they cannot. Isaiah 64:6 teaches that even our best human efforts are as worthless filthy menstrual rags in God's sight. God cannot be impressed with human effort. That's why Jesus Christ was sent into the world, to go to the cross to be crucified for OUR SINS!!! If we could earn or merit our way into Heaven, then why did Christ need to bleed and die? Do you really believe that Mary has power in Heaven? If you do, can you show me even one single Bible verse to support your beliefs? No, you certainly cannot! Mary can give you nothing. Over one billion Roman Catholics have been sold a lie by the Devil that Mary can influence God, to their personal benefit here on earth. Yet the Bible plainly teaches in 1st Timothy 2:5-6, “For there is one God, and one mediator between God and men, the man Christ Jesus; Who gave himself a ransom for all, to be testified in due time.” Did you read that? There is only ONE MEDIATOR between God the Father and men, and that Mediator is the Son of God, JESUS CHRIST!!! The Word of God clearly tells us to address God as “Our Father, which art in Heaven” for our daily bread and needs. We are to pray to the heavenly Father in Jesus' name, NOT through Mary's name. There is NO heavenly “Mother.” Mary is a sinner, deserving of Hell. Mary needed to get saved by trusting Christ Jesus as her Savior, just like everybody else does. If you don't receive Christ (John 1:12), you'll go to Hell (Revelation 20:15). Mary can do nothing to help you on Judgment Day, if you die in your sins without Christ as your personal Savior. Jesus exclaimed, “YE MUST BE BORN AGAIN” (John 3:3)!!! Do you believe that Jesus is the I AM, the Christ, the Savior of the world? If you'd like to be saved now, Click Here.